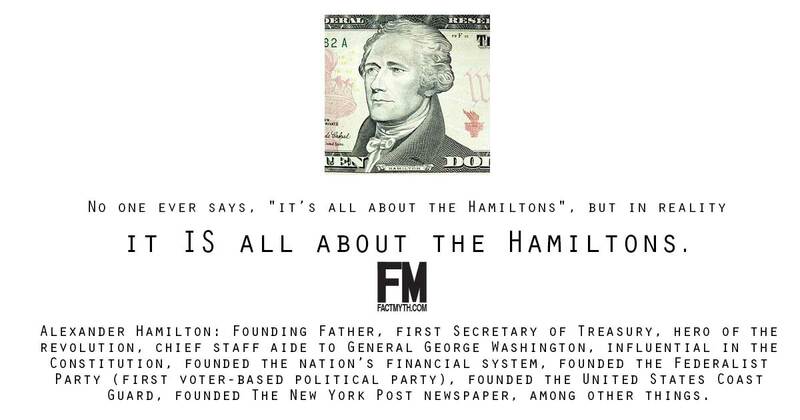 Alexander Hamilton Founded the Federalist Party - Fact or Myth? Alexander Hamilton founded the Federalist Party. The Federalist party grew out of a coalition of Hamilton’s friends in government, bankers, and businessmen who Hamilton organized against Jefferson and Madison’s collation of Anti-Federalists (a movement, not a party), over issues like the Jay Treaty (1794). The party begins to form in 1787 when Hamilton, Jay, and Madison begin to pen the Federalist Papers, but officially takes form between 1792 – 1794 starting with the 1792 Washington elections. FACTS ABOUT ALEXANDER HAMILTON: Hamilton was a Whig-like liberal-conservative, and dare I say globalist, who favored “big government” and abolitionism. He also founded the Party that would become the modern Republicans. He was also the first Secretary of Treasury, argued for the Constitution via his Federalist Papers, favored a strong central government, established the U.S. Mint and a First National Bank, founded the United States Coast Guard, founded The New York Post newspaper, argued for a central currency and helped America on the path to super power, generally helped structure the military, was a hero of the revolution, and was chief staff aide to General George Washington. If one understands Hamilton they understand the Federalists, and if one understands the Federalists, they understand Hamilton. The Federalist Party. An introduction into the Federalist Party organized by Hamilton. TIP: The Federalists are conservative in many respects, favoring big banks and big government. Even their pro-trade mentality had an aspect of conservatism to it (despite them favoring global trade). The Federalists were more protectionist than the anti-Federalists, but they notably favored a version of protectionism that would result in enough tax revenue to ensure a strong state. Prior to events like the American Revolution, trade was regulated by Kings and Churches. So while Hamilton’s brand of federal-government-first Federalism stands in stark contrast to Jeffersonian individual rights focused “radical” liberalism (and favoring of state power over federal power), it is still a type of liberalism (conservative liberalism in most respects, but social liberalism on key social issues in the case of figures like Hamilton). The Federalist Party played off Hamilton’s successful Federalist ideology as presented in the pre-Constitution Federalist Papers (1787). The papers were penned openly with John Jay and the sometimes-Federalist James Madison, but were signed anonymously. The papers, like the Federalist Party itself, generally supported a strong central Republican Government, instead of the then Confederacy (calling for more central authority and order than Jefferson’s group wanted). The popularity of the papers led to the ratification of the Constitution, the creation of the Federalist Party between 1792 and 1794, Hamilton’s increased influence in politics, and ultimately Hamilton’s ability to enact key economic policies including setting up the first national bank. None of these made him particularly popular with the Anti-Federalists, or with other Federalists for that matter. In fact, Hamilton wasn’t that popular with citizens either, despite his popularity among powerful founders and his increasing popularity in retrospect. ALEXANDER HAMILTON. This Hamilton documentary goes into lengths explaining his life and character. FACT: Major General Alexander Hamilton was also a war hero and helped to found the U.S. military’s structure and culture. The oldest Army regiment in existence is Hamilton’s, the 5th Field Artillery Regiment. FACT: Hamilton was perhaps one of the most vocal founding fathers in terms of standing against slavery. He was an active abolitionist. Want to learn about Hamilton? Don’t just read our essay, check out the Life Hamilton, a book based on family letters, and an essay on Hamilton from Charles Arthur Conant. The Federalist party dominated American politics from the 1790’s – 1801 and continued as a force until around 1816. During this time the Party broke into factions with Hamilton in one faction and John Adams, the only Federalist President, in another faction. The Democratic-Republicans, who came into power in 1801 were Jefferson’s party. They had grown out of the Anti-Federalist movement and opposed The Federalists. Hamilton notably supported Jefferson as President in 1801, in part to oppose Adams and in part to block Aaron Burr (an influential New York politician and ex-friend of Hamilton) from the Presidency. Burr then became Jefferson’s Vice President from 1801 – 1805. The ongoing rivalry between Burr and Hamilton eventually led to a fatal duel in which Hamilton was shot by Burr in 1804. FACT: Hamilton died in a truly Hamiltonian style. Hamilton did not like dueling, but was honor-bound to accept the dual when he realized Burr would not back down. He had thought that the country would need him, and didn’t want to risk being seen as a coward or dishonorable. He said in his notes that he planned to fire into the air (in this way he could face Burr without hurting him)… but Burr shot him dead. Hamilton was a great father to the country, but he was also good at making bitter enemies. FACT: Hamilton created the first political party, while Burr is known as the father of modern political campaigning. Later Henry Clay and Martian Van Buren would mirror Hamilton, Jefferson, and Burr’s divisive political tactics to help spur on modern party politics over the 1824 and 1828 elections. Alexander Hamilton doesn’t have the name recognition of other founders, but he was one of the most important by any measure, especially when it came to economics and monetary policy. His face is on the $10 bill. Hamilton didn’t just create the first voter-based party when he created the Federalist Party; he cemented in an economic ideology that dominates the U.S. and world politics today. Hamilton’s most accomplished title outside of war hero and author of many Federalist Papers is arguably first Secretary of Treasury of the United States under George Washington. Hamilton and his Federalists fought for a national bank, federal power, and wanted the federal government to take on a debt and credit relationship with the states. They wanted to ensure a balance of interests and peace between the plantation-based economies in states like Georgia and the trade-based economies in cities like New York and Boston. Each had unique income sources, expenses, and views on debt. The South paid debt while the financiers in the North liked to buy it for pennies on the dollar to trade as an asset. Hamilton knew that globalization and trade, along with a system of credit and debt, (whether it be in America or the world) was the key to America’s future power, peace, and prosperity. He also knew many in the South, including Jefferson, wanted a more democratic classically liberal and more radical society with less authority and international relations. These differences played out in a real way with the establishing of a national bank, which allowed the Federal Government to take on debt and which favored the financiers in the North. The process aggravated Southerners who had repaid their bonds and were consequently in less debt after the War. The Nation’s Capital was moved as a concession. Similarly, Hamilton’s Federal ideology in regards to the power structure, the Constitution, and monetary policy including taxation came into play after the Whiskey Rebellion. The Whisky Rebellion was a protest over a tax levied by Washington that hurt farmers. The Federal Government put down the rebellion as putting down uprisings being the main purposes of the Second Amendment’s well-regulated militias. FACT: Hamilton grew up in the Caribbean and was orphaned at the age of 13. His difficult upbringing helped to shape his character. The Influence of Hamilton and the Federalist Party, What Can We Learn? Many aspects of American politics can be understood by contrasting the political left-right stances of Hamilton and Jefferson and their friends like Burr, Adams, Washington, Jay, and Madison in regards to their views on liberalism in theory, in practice, and in the result. The Federalists wanted big government to protect collective rights and prosperity, despite the risks of what elites and bankers might do with that power, and the Anti-Federalists want small government and favored individual rights, despite the dangers of mob rule and social injustice at the hands of private interests. The Federalists wanted order and authority, which some considered tyranny. The Anti-Federalists want freedom and liberty, which some considered anarchy. Consider that the Federalists are instrumental in the Constitution, and Anti-Federalists in the Bill of Rights. Likewise, when we focus on nationalism and nativism, when we support of individual rights despite the social costs, we are keeping alive the spirit of the Anti-Federalists. By tempering the two long-held American traditions, we can find our bearings in any political climate. TIP: Divisive issues like immigration and religion aren’t hot button issues in America yet, and slavery has yet to divide the country, so the North/South divide is over types of liberalism more than what we today consider conservatism. TIP: See Federalists vs. Anti-Federalists, the origin of left and right, the birth of liberalism, the founding fathers as liberals, and the basic political parties for more reading. TIP: Although there was two central banking system before the 1900’s, Hamilton wouldn’t get his wish for a strong central bank until 1900’s. A long line of Anti-Federalists, then Democratic-Republicans, then Democrats, then starting in the 1900’s or so Republicans, fought tooth and nail against central banks (burning down the first two). They had always favored nativist, nationalist, and agrarian interests. Today we call pro-regulation and banking Hamilton-like Democrats “neo-liberals.” The other faction of Federalists were the civil-service and social-justice Federalists. This faction starts under Clay and the Whigs and with Republicans like Lincoln, but can be seen in those like Madison when he was acting as a Federalist. Later, as Republicans break into factions after Civil War Reconstruction, we get factions that the Democratic party helped to shape into the parties of today starting in the Fourth Party progressive era. TIP: By the early 1790s newspapers started calling Hamilton supporters “Federalists” and their opponents “Democrats,” “Republicans,” “Jeffersonians” (people who supported Thomas Jefferson, the Third President), or “Democratic-Republicans.” Jefferson’s supporters usually called themselves “Republicans” and their party the “Republican Party.” This would make things simple as far as timelines go. However, history is not simple. Jefferson ran as a Democratic-Republican and Lincoln (from the line of Federalists and Whigs) was the first Republican President. TIP: Historically we can consider Hamilton Whig-like, but Jefferson considered him Tory-like. Jefferson compared him to a conservative, not even an English Whig, and certainly not a Jacobin French revolutionary liberal. Does this mean Hamilton formed both the first conservative American party and the party that would become today’s liberal Democrats? Yes it does! History is complicated. Please explore how the parties switched platforms. Alexander Hamilton: Biography, Accomplishments, Children, Economics, Education, Facts (2003). A C-Span2 lecture from a Hamilton biographer.